City Council Voter District 5 proposed tree-planting in Carter Jones Park. They partnered with the Alliance for the Chesapeake Bay, along with Richmond Tree Stewards, Richmond Parks, Recreation, and Community Facilities, RVA Clean Sweep and Groundwork RVA. This project took place on October 20, 2018. Alliance for the Chesapeake Bay received a grant through Altria to fund the project. City Council Voter District 5 proposed tree-planting in Canoe Run Park. They partnered with the Alliance for the Chesapeake Bay, along with Richmond Tree Stewards, Richmond Parks, Recreation, and Community Facilities, RVA Clean Sweep and Groundwork RVA. This project took place on November 17, 2018. Reedy Creek Coalition proposed tree-planting at 301 Covington Road in Richmond. 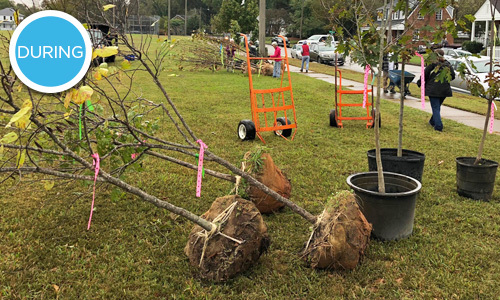 They partnered with the Alliance for the Chesapeake Bay, along with Richmond Tree Stewards and Richmond Parks, Recreation, and Community Facilities. This project took place on February 17, 2018.